Of course this is nothing new, popular culture has for generations consumed and reconstructed the ethnographic in film, fashion and music. There does, however, seem to be a yearning, maybe a as consequence of increasing globalisation, for an escape to a 21st century imagined ethnographic simplicity. Around the world people are increasingly trying to reconnect culturally, whether it’s Mexicans and their Aztec ancestors or Britons and Druids. In this pursuit both music videos and museums play an extraordinarily influential role, both tangibly and intangibly. Today Buckingham Palace sadly announced the death of Monty, one of the Queen’s beloved corgis. It’s well known that the Queen has a particular affection for the Welsh corgi but her predecessors had a fondness for much more exotic breeds. Both the Pekingese and borzoi are two of the focus breeds featured in our forthcoming exhibition Breed: The British and their Dogs, and their patronisation by the royal family is well documented. Queen Victoria’s Pekingese Looty was presented to her by Lieutenant Dunne in the late 19th century. Dunne, along with other British and French troops, had captured the dog following the defeat of China in the Second Opium War in 1860. 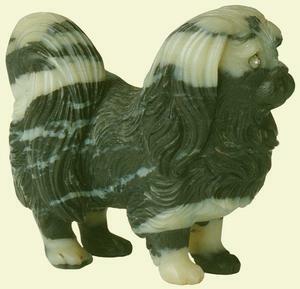 Prior to this the Pekingese had belonged exclusively to the Chinese imperial household. 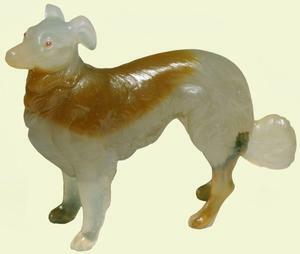 Pekingese figure made by Carl Fabergé. UK, 1907, precious stone. The Royal Collection © 2012, Her Majesty Queen Elizabeth II. The borzoi had equally impressive imperial connections. This breed, originally used for hunting wolves, was a favourite of the Russian imperial family, and the Tsar’s kennels were globally renowned. This imperial proximity and luxurious association made it the target of Russian revolutionaries in 1917. The Tsar’s kennels were closed and the dogs destroyed. In Britain breeders mobilised to prevent the borzoi’s extinction, this action was dominated by aristocratic women including Queen Alexandra. Borzoi figure made by Carl Fabergé. UK, 1907, precious stone. The Royal Collection © 2012, Her Majesty Queen Elizabeth II. The Royal Collection have very kindly loaned us several objects which illustrate this royal love affair, two of which you can see above. Over the next several weeks I will reveal the remaining three focus breeds and more of the wonderful objects we’ll have on display.